Electric-blue "night-shining" clouds can be seen swirling over the skyline of Nykøbing Mors in Denmark on July 1, 2016. 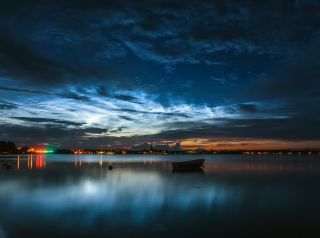 Bright blue-white noctilucent clouds danced over the town of Nykøbing Mors in Denmark just before dawn, just when this spectacular photo was taken. Night sky photographer Ruslan Merzlyakov captured a series of nightscape images in the early morning of July 1, 2016. With electric-blue clouds swirling overhead, the small town is illuminated and the twinkling lights of the quaint skyline are reflected in the calm waters below. "The whole horizon over Nykøbing Mors from west to east was filled with silver light and it was very bright!" Merzlyakov wrote in an email to Space.com. Glowing silver-blue clouds commonly light up summer night skies in the Northern Hemisphere. Noctilucent clouds form in an upper layer of the Earth's atmosphere called the mesosphere, which is about 50 to 53 miles (80 to 85 kilometers) above ground. At this altitude, these rare clouds are high enough to reflect light, even after the sun has slipped below the horizon. Noctilucent clouds are made of extremely small ice crystals that reflect light and give off a bluish color, largely due to the absorption of red light by the stratospheric ozone layer. In the right corner of this photo, the orange-red glow of the rising sun is visible as it creeps over the horizon, which adds contrast and depth to Denmark's summer night sky. Merzlyakov used a Canon EOS 6D and a Samyang 24mm f/1.4 to photograph and record a real-time video of the noctilucent clouds over Nykøbing Mors on July 1. To see more amazing night sky photos submitted by Space.com readers, visit our astrophotography archive.